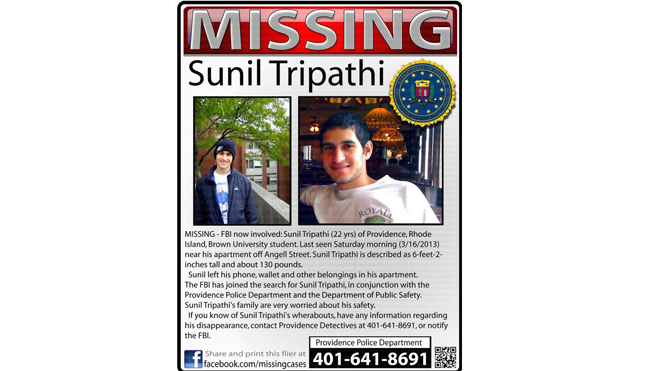 22 year old Brown University student Sunil Tripathi has been reported missing and was last seen on March 16, 2013. Tripathi, a philosophy major at Brown who grew up in Bryn Mawr, PA, he was last seen on Saturday March 16 on the east side of Providence around 11 am. According to his sister, his wallet, ID cards, credit cards and cell phone found were in his room. The search for Sunil Tripathi has expanded outside of Providence to Boston, Connecticut, New York, and Philadelphia. Sunil Tripathi has been living in Providence since 2008. He was on approved leave from Brown. Brown University reported Saturday that the search is expanding outside of Providence to Boston, Connecticut, New York, and Philadelphia. Tripathi is 6 feet tall and was last seen wearing blue jeans, a black ski jacket, glasses and a wool hat. The FBI has joined the searchwith the Providence Police Department and the Department of Public Safety for Sunil Tripathi, a former member of the class of 2012 who went missing Saturday morning. We want to pass along an update this evening about our day. If anyone has any has seen or has any information regarding Sunil Tripathi and his disappearance, please contact Providence Detective Mark Sacco at (401) 641-8691 or the FBI. For more updates, to provide your opinions and analysis and to read others, go to Scared Monkeys Missing Persons forum: Sunil Tripathi.